In multi-criterion optimization, Pareto-optimal solutions that appear very similar in the objective space may have very different pre-images. In many practical applications the decision makers, who select a solution or preferred region on the Pareto-front, may want to know different pre-images of the selected solutions. Especially, this will be the case when they would like to present alternative design candidates in later stages of a multidisciplinary design process. 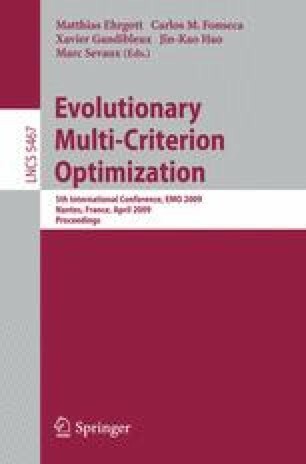 In this paper we extend an existing CMA-ES niching framework, which has been previously applied successfully to multi-modal optimization, to the multi-criterion domain for boosting decision space diversity. At the same time, we introduce the concept of space aggregation for diversity maintenance in the aggregated spaces, i.e. search/decision and objective space. Empirical results on synthetic multi-modal bi-criteria test problems with known efficient sets and Pareto-fronts demonstrate that the diversity in the decision space can be significantly enhanced without hampering the convergence to a precise and diverse Pareto front approximation in the objective space of the original algorithm.